This is another instructional book on coloured pencils published by Ann Kullberg. The author is Cynthia Knox, a professional coloured pencil and graphic artist. She has published several books on pencil drawing and also teaches a course Vivid Flowers in Colored Pencil on Craftsy. 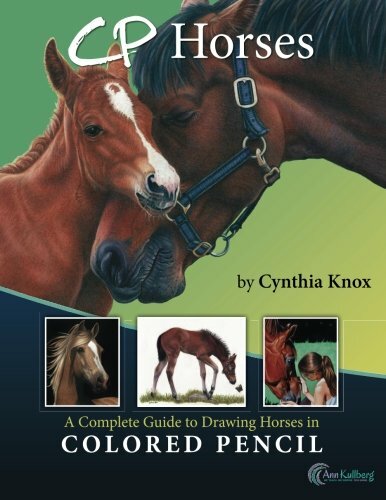 Her latest book CP Horses is on drawing horses with coloured pencils. It's a comprehensive instructional book with 9 mini demonstrations and 4 full length ones from start to finish. The content covers the tools you need and assumes no prior knowledge to coloured pencil usage. There are tips on how you can take a good photograph for reference. You can also read about interesting facts about horses through Cynthia's observations. The tutorial instructions are clear and easy to follow. Prismacolor pencils are used. Each colour used are mentioned in the steps and the techniques are also explained and shown with illustrated examples. There are step by step pictures that accompany the tutorials and overall it's really in-depth. Many of the mini demonstrations focus on the features of the horses, such as the eyes, ears, mouth and hair. The full length demonstrations are of complete horse portraits. It's a fantastic book for learners who want to use coloured pencils for portraying horses. There's also another book in this series on drawing cats called CP Cats by Gemma Gylling that you can also check out.